Featuring the Zappa nesting chair collection from Ergocraft. These office nesting chairs are available in your choice of (5) different commercial grade, stain resistant fabrics. Other features include a igh impact polypropylene shell seat shell, ventilated backrest with carry handle, foam padded seat cushion, commercial grade seat upholstery and dual wheel carpet casters for easier mobility. 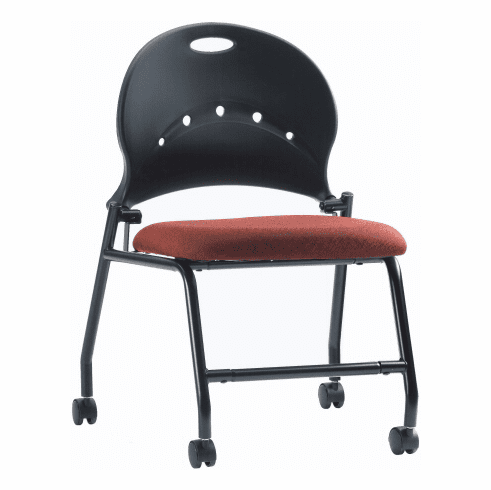 These nesting chairs are ideal for any training or conference room. Nests with other Zappa chairs for space saving storage. Optional armrests available for this model. Meets or exceeds ANSI/BIFMA standards. Dimensions: Seat Size: 20"W x 19.5"D. Back Size: 22.5"W x 25.75"H. Seat Height Adjustment: 18 -24"H. Overall: 46.25"H x 27.25"W x 25.75"D. 12 year limited warranty from Ergocraft. This chair normally ships within 2-3 business days from our CA warehouse.